A few months ago, I guest blogged over at my friend Meagan’s blog: A Zesty Bite. Meagan and I have had the chance to meet in real life twice. First at Food Blog Forum followed by a few weeks later at BlogHer Food. We hit it off instantly and I’m so grateful for our friendship! That is one of the perks of blogging–you meet so many amazing new people. People you get to call your friend. People whom you tweet, and private Facebook message, and send emails too. And if your lucky text with randomly at all hours of the day just because you wanted to say “hi”! Back in May, I shared my recipe for Bacon Refried Beans. Creamy pinto beans smashed and infused with bacon fat and then to top it off crumbled bacon, gobs of cheese, and freshly sliced green onions. Well what do you do when you have just a little bit of refried beans leftover? 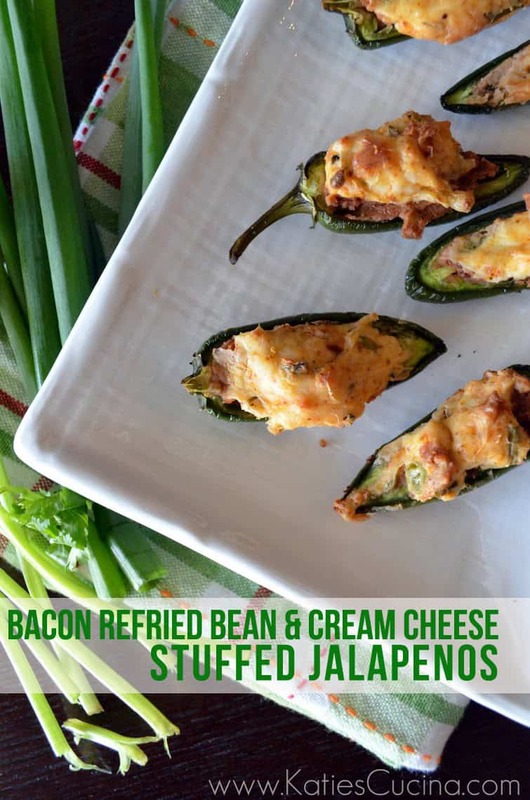 Why, you split open a dozen jalapeno peppers and stuff them full of cream cheese and bacon refried beans. Not only is this a simple appetizer to make, but a great way to use up leftovers! Since your removing the seeds from the jalapenos you’ll be surprised that they aren’t too spicy. They have just the right amount of cook. Plus the creaminess from the bacon refried beans and cream cheese tends to balance out the spicy jalapeno. The cream cheese topping bakes up nicely and I’ve found that baking these on a wire cooling rack on top of sheet yields the best baking results. The outer skin of the jalapeno will be crisp and baked evenly. Rinse and cut jalapeno peppers in half and remove seeds. Set to the side. Mix the cream cheese with cumin and chili powder along with cilantro and green onions. Spread a thin layer of bacon refried beans in each of the jalapeno peppers followed by a layer of cream cheese. Bake on a cookie rack lined baking sheet for 20 minutes. Serve immediately and enjoy! These look amazing! Thanks for sharing 🙂 Have a fabulous weekend. Holy lord! These sound incredible! I’ll take a dozen! They sound amazing! Oh, wow! Just when I thought jalapeno poppers couldn’t get any stinkin’ better! These little buggers look so delicious, I think I’m going to have to try them this weekend! I hope you’ll consider sharing your recipe on my Foodie Friday Blog Hop at A Room for Two with a View. I know my readers will love it! Thanks Melissa! They are a great appetizer! Oh goodness! I love stuffed peppers 🙂 this recipe is fantastic! These look so delicious- I never would have thought to put this combo together but it is pure genius! Thanks for linking up with us at Life Inspired!